I’m kind of in love with this site. Fascinating post today about the popularity of the sale of stereotypical (and just plain racist) images of blacks. When you read the post, scroll down for some commentary on Mammy figurines, being mass produced in China. I was at the store, which sold both antiques and new stuff, just looking around, and I came upon the figurine on the left sitting on a shelf. 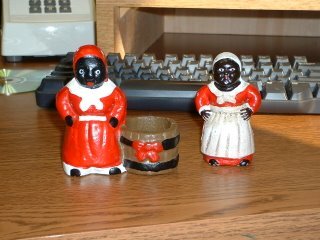 I was looking at it and thinking how bright the paint was and how well it had been preserved, and that it was odd that an old mammy figurine wouldn’t have any scratches or anything on it. And I picked it up and looked at the bottom…and noticed that it said “made in China.” I turned around, which is when I saw a big barrel full of these two figurines. Tons of them. And I realized it wasn’t an antique at all; they are currently being mass-produced in China because there is apparently a market for new versions of old racist stuff. I cursed myself for not having a camera phone so I could just take a picture of them, and after considering for a little while, decided to go ahead and buy $5 worth of racist reproductions to use as examples in my classes (no, it did not occur to me to take a picture of them and return them; that just occurred to me right now). And… more link love for Sociological Images – this post on African People As Props for White Femininity. I surely thought there was no reason for these to be produced anymore. Guess I was wrong! WOW…I cannot believe that these are still be produced and sold. I am absolutely speechless. We clearly have not advanced very far at all. Great post and so true. It’s also hard to believe that there’s a market for them. Why? I guess we all know why. But still… What is wrong with people? Okay, I know that, too. I know the answers in my head, but I still cannot figure them out. Thank you for sharing this. The five bucks was worth it. Maybe you could return them. I’d love to hear if they give you any grief about a return.